We all use radar to assist in planning outdoor activities. Should we bring an umbrella? Is a severe thunderstorm on its way? Or will we be dry the rest of the day? While radar helps us forecast upcoming weather, few understand exactly how it works. The evolution of radar is an interesting one and it's surprising how such a vital instrument got its start. RADAR stands for RAdio Detection And Ranging and was slowly developed over time starting way back in the late 1800s. By the start of World War II, many countries used it to detect enemy ships and aircrafts. When radar operators discovered that precipitation caused 'false' echoes on their screen (masking potential enemy targets) they realized the new found potential of radar. Soon after the war surplus radars were used as precipitation detectors. Since this time, the modern weather radar has evolved and improved a great deal, incorporating better data retrieval methods and higher resolution data. In fact, most modern weather radars are now pulse-Doppler radars, and are capable of detecting the motion of rain droplets in addition to the intensity of the precipitation. Today, specialized software use radar data to make short term forecasts, and it is even incorporated into numerical weather prediction models to improve the accuracy of forecasts. So, how exactly does it work? 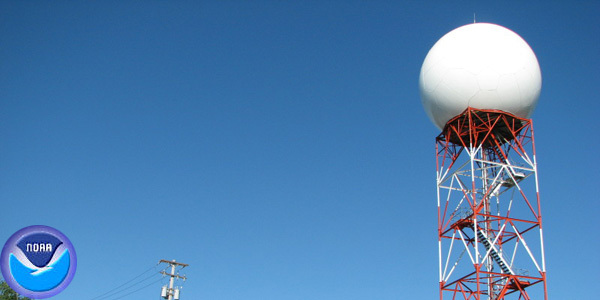 A modern Doppler radar system consists of a large radar dish housed inside an even larger hexagonal dome to protect it from the elements. The radar dish can rotate 360 degrees in the horizontal and approximately 20 degrees in the vertical. As the radar antenna turns, it emits extremely short bursts of radio waves, called pulses and waits for these pulses to return during the "listening period". Each pulse lasts about 0.00000157 seconds with a "listening period" of 0.00099843 second. The transmitted radio waves move through the atmosphere at around the speed of light. Once it hits a target such as a raindrop or snowflake, the radio waves are scattered with some of the energy returning back to the radar. Radar observes all of this information during the “listening period” with the process repeated up to 1,300 times per second. Observing the time it takes the radio waves to leave the antenna, hit the target, and return to the antenna, the radar can calculate the distance and direction of the target using the “Doppler effect” (hence the title Doppler radar). In addition, the returned energy the radar receives provides information on the target’s characteristics including size, intensity and with the newest Dual Polarized radars, even precipitation type. By utilizing the Doppler Effect, Doppler radars provide information regarding the movement and positions of targets. After the radar emits a pulse of radio waves, it tracks the phase shift between the transmitted radio wave and the received echo. This phase shift shows whether the target is moving directly toward or away from the radar, called its radial velocity. A positive phase shift implies motion toward the radar and a negative shift suggests motion away from the radar. The phase shift effect is similar to the "Doppler shift" observed with sound waves. If an object emits sound waves as it approaches a location, the waves are compressed leading to a higher frequency. As the object moves away from a location, the sound waves are stretched leading to a lower frequency. This is often experienced when an emergency vehicle drives past with its siren blaring. The National Weather Service is currently using dual-polarization radars for their network. While conventional radars emit and receive pulses in the horizontal direction, dual-polarization radars go a step further and transmit and receive waves in the horizontal and in the vertical direction. This provides a more complete picture of targets in the atmosphere, allowing forecasters to differentiate between rain, snow/melting snow, and even hail.